Download "DIMENSIONS OF SUSTAINABLE DEVELOPMENT Vol. I - Human Capital for Sustainable Economic Develpment - G. Edward Schuh"
6 production technology and education at the heart of the modernization process, can explain the completely divergent growth paths of economies as disparate as Japan (labor-abundant) and the United States (land-abundant). It is also capable of explaining much of the disparate growth rates of agriculture in a large number of countries around the world. The first edition of their book also emphasized the necessary institutional arrangements (an additional form of human capital) to bring about the process of induced technical change. In their 1985 edition they carry this analysis forward by developing a theory of induced institutional change. The Hayami-Ruttan analysis, with its emphasis on human capital, is now the most widely accepted interpretation of agricultural development. It is also the most widely used framework for guiding policy for agricultural development. 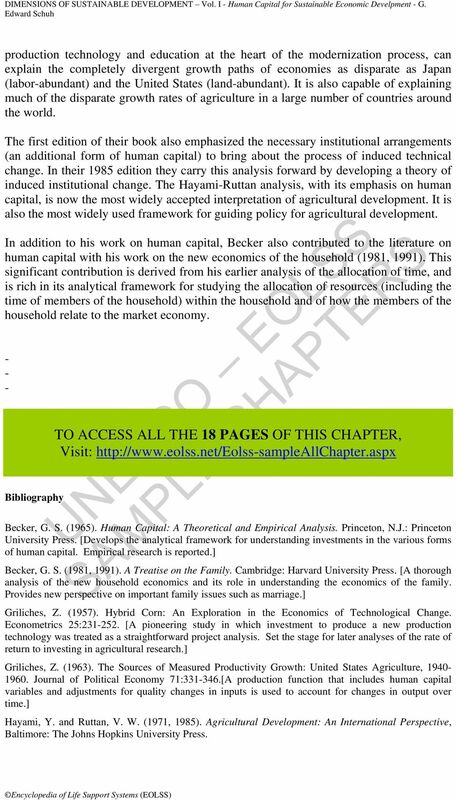 In addition to his work on human capital, Becker also contributed to the literature on human capital with his work on the new economics of the household (1981, 1991). This significant contribution is derived from his earlier analysis of the allocation of time, and is rich in its analytical framework for studying the allocation of resources (including the time of members of the household) within the household and of how the members of the household relate to the market economy Bibliography TO ACCESS ALL THE 18 PAGES OF THIS CHAPTER, Visit: Becker, G. S. (1965). 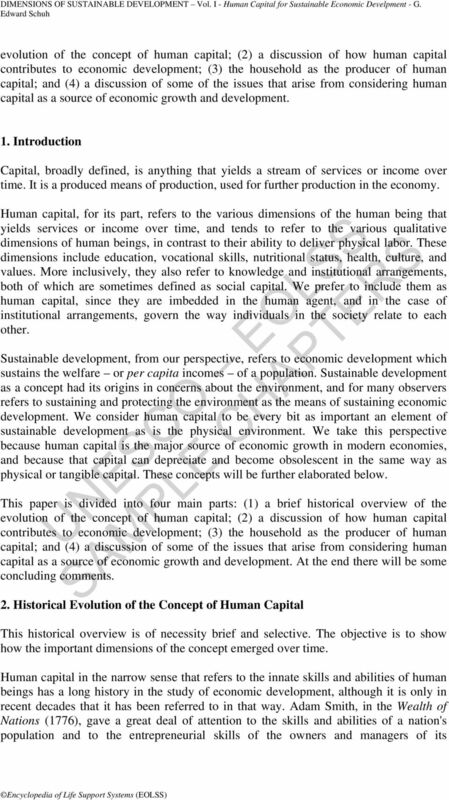 Human Capital: A Theoretical and Empirical Analysis. Princeton, N.J.: Princeton University Press. [Develops the analytical framework for understanding investments in the various forms of human capital. Empirical research is reported.] Becker, G. S. (1981, 1991). A Treatise on the Family. Cambridge: Harvard University Press. [A thorough analysis of the new household economics and its role in understanding the economics of the family. Provides new perspective on important family issues such as marriage.] Griliches, Z. (1957). Hybrid Corn: An Exploration in the Economics of Technological Change. Econometrics 25: [A pioneering study in which investment to produce a new production technology was treated as a straightforward project analysis. 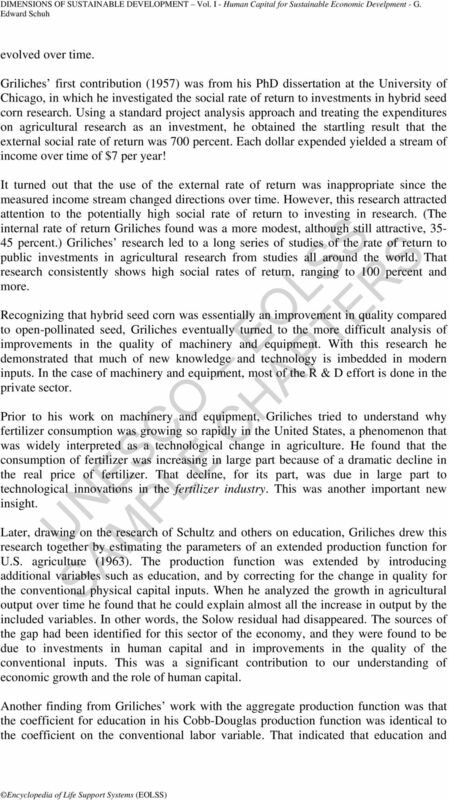 Set the stage for later analyses of the rate of return to investing in agricultural research.] Griliches, Z. (1963). The Sources of Measured Productivity Growth: United States Agriculture, Journal of Political Economy 71: [A production function that includes human capital variables and adjustments for quality changes in inputs is used to account for changes in output over time.] Hayami, Y. and Ruttan, V. W. (1971, 1985). Agricultural Development: An International Perspective, Baltimore: The Johns Hopkins University Press. 7 North, D. C. (1990. Institutions, Institutional Change, and Economic Performance, Cambridge: Cambridge University Press. [An ambitious explanation of the role of institutions in the evolution and growth of Europe and the United States.] Schuh, G. E. and S. O. Archibald (1996). A Framework for the Integration of Environmental and Sustainable Development Issues into Agricultural Planning and Policy Analysis in Developing Countries, pp in S. A. Breth, ed., Integration of Sustainable Agriculture and Rural Development Issues in Agricultural Policy, Proceedings of the FAO/Winrock International Workshop on Integration of SARD Issues in Agricultural Policy, Rome, Winrock International. 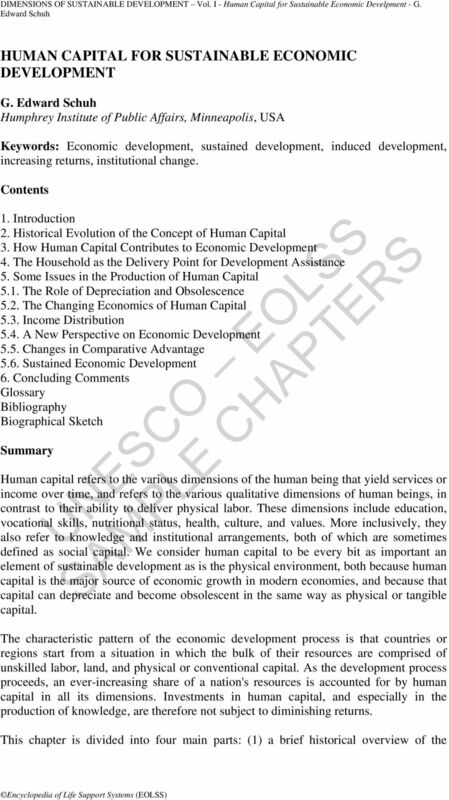 [Explores the role of human capital as the key to sustainable economic development. Argues that as an economy develops, human capital becomes increasingly important.] Schuh, G. E. (1999). Agriculture and Economic Development. The Chicago Policy Review, pp [Analyzes the ways that agricultural modernization contributes to general economic development. The alternative contributions of stable, non-tradeable and tradeable commodities are considered.] Schultz, T. W. (1961). Investment in Human Capital. The American Economic Review 51(5). [The modern rediscovery of the importance of education as a source of economic growth. Original estimates of the social rates of return to such investments.] Schultz, T. W. (1964). Transforming Traditional Agriculture. New Haven: Yale University Press. [Integrates the knowledge generated on education and new production technology as sources of agricultural modernization. A provocative discussion of the significance of equilibrium in agricultural labor markets.] Solow, R. (1957). Technical Change and the Aggregate Production Function. 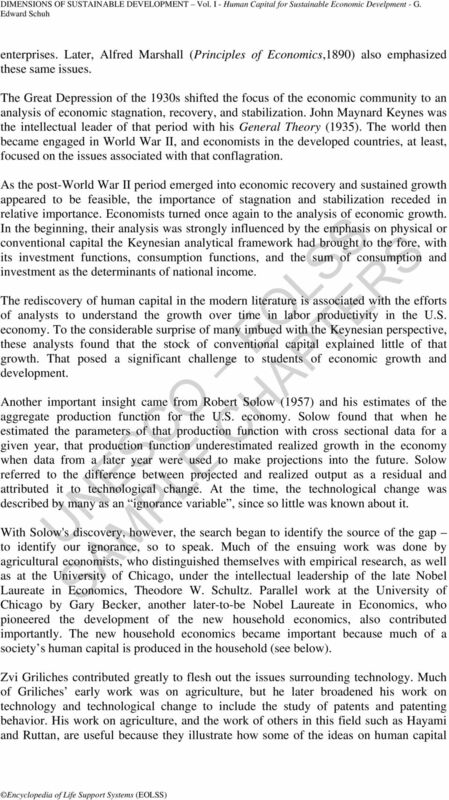 Review of Economics and Statistics 39: [Pioneering research that identifies how little we know about sources of economic growth and identifies it as an ignorance variable.] Welch, Fimis (1970). Education in Production. 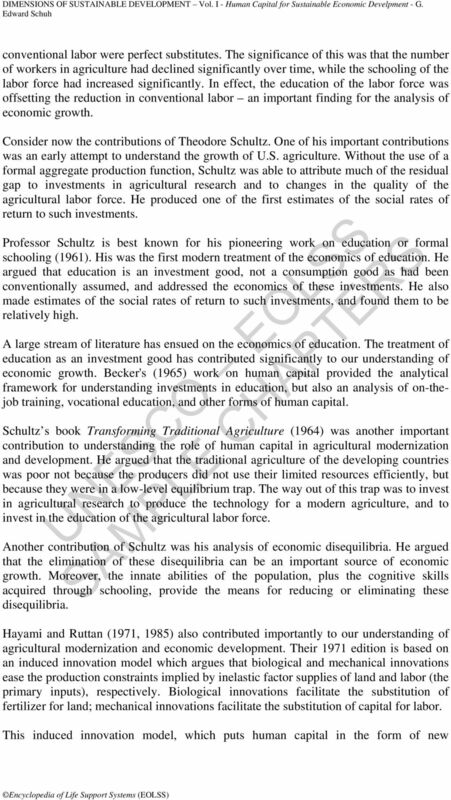 Journal of Political Economy 78: [Identifies the various contributions that education makes to increasing output. Emphasizes complementarity between education and new production technology.] Biographical sketch G. is Regents Professor of International Economic Policy at the University of Minnesota, and Orville and Jane Freeman Professor of International Trade and Investment Policy at the Humphrey Institute of Public Affairs in Minneapolis. He has contributed internationally as an educator, administrator, adviser, consultant, and author in the areas of economics and agriculture, with particular interest in subjects including agricultural and food policy, economic development, international trade, and exchange rate policy. His work has included extensive travel throughout the world with particular emphasis on South America and Latin America. He is the author or co-author of six books, has edited an additional six books, and has over 100 technical and scientific papers to his credit. Schuh chairs the Board for International Food and Agricultural Development, which advises the Administrator of the U.S. Agency for International Development. 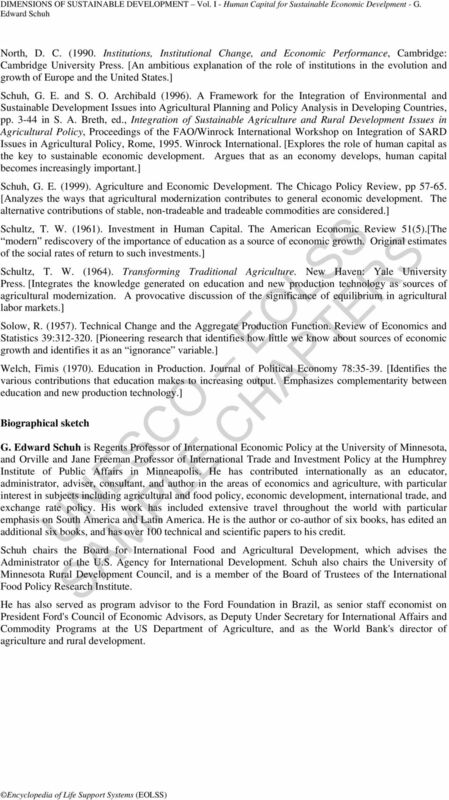 Schuh also chairs the University of Minnesota Rural Development Council, and is a member of the Board of Trustees of the International Food Policy Research Institute. He has also served as program advisor to the Ford Foundation in Brazil, as senior staff economist on President Ford's Council of Economic Advisors, as Deputy Under Secretary for International Affairs and Commodity Programs at the US Department of Agriculture, and as the World Bank's director of agriculture and rural development. Why Did House Prices Drop So Quickly? Macroeconomics 2301 Potential questions and study guide for exam 2. Any 6 of these questions could be on your exam! Week 1: Introduction to Modern Macroeconomics. Microeconomics vs. Macroeconomics. Great Depression and Birth of Macroeconomics. Economics 340: International Economics Andrew T. Hill Heckscher-Ohlin Theory Textbook Readings: Pugel & Lindert, International Economics, 11th Edition, pp. 54-57, 61-76. 10th Edition, pp. 50-52, 57-69. Does Debt Relief enhance Growth in Third World Countries?